Very difficult to find a similar product in the B & M marketplace. Beautifully crafted and looks great on. Nothing beats a nice leather belt made from genuine cowhide. The rich smell of good quality leather adds a masculine touch to your trousers and the leather only seems to get better with age. All models are in stock. A belt is for more than just keeping your trousers up. Here are a few suggestions to follow when choosing your new belts. When accessorizing a tasteful men's suit one should always keep the on going colour scheme in mind. So if the tie-pin and cuff-links are gold in colour, it is imperative that your belt buckle must also be gold-coloured. Match the leather looks. When wearing polished black leather shoes your belt should also be high gloss black in colour. Like wise, brown matte shoes will be better matched with a matte brown leather belt. And if you have fabric shoes on then a sharp looking fabric belt should do the trick nicely. All leather products can be divided into two quality categories. Split leather is the lesser of the two grades of leather and is often used in quite delicate products. Split leather is an actual animal hide that is split into thinner layers thus separating the outside leather where the hair grew from inside layers. Because split leather is not as smooth as the skin side due to tearing layers from each other, a piece of real or synthesized leather is glued on the surface. Full grain leather is the opposite of split leather as it is the outer part of the hide. Belts made from full grain leather are of superior quality and can last a lifetime when properly maintained. 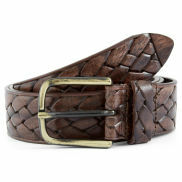 The Danish brand Bosswik is renowned for its full grain leather belts. 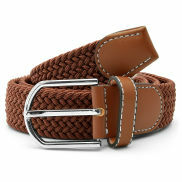 Most of Trendhim belts are full grain leather as can be seen in the description page. The only maintenance a full grain leather belt requires is an application of good quality leather grease a couple of times per year. This will make the leather softer, reduce cracking while improving its water and stain resistance. 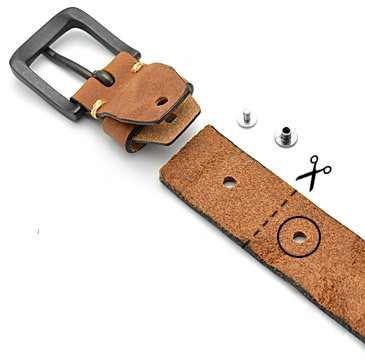 Unless otherwise stated on the product description page, we specifically state the belt's waist size, that is the measure from the tip of the belt buckle to the center hole as shown below. Of course you can measure one of your own belts to determine the right size for ordering. For the elastic belts, we give you an approximate length because they obviously have some give to them. As an alternative to give you a lot of flexibility you can alter the size of your belt by simply cutting off a section as shown here under. All you need is a knife sharp enough to cut through leather and a strong multi-hole puncher.